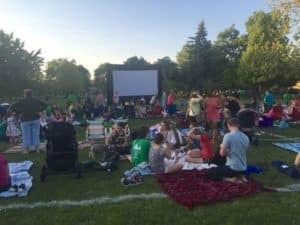 It’s summer, and that means it’s time for free Movies in the Park! The Elmhurst Park District invites you to watch two animated family movies in Wilder Park: “Moana” on June 13 and “Sing” on June 15. Arrive at 7:30 p.m. or later to get your spot on the lawn. Movies begin at dusk, approximately 8:30 p.m. Food trucks will be on hand, so you can purchase something to eat, or bring food with you. At Elmhurst Toyota, we appreciate the summer tradition of Movies in the Park and hope you’ll join us at Wilder Park this week. Both “Moana” and “Sing” were big hits when they were released in 2016. “Moana” is the tale of a young girl who is the daughter of a village chief in ancient Polynesia. She is chosen to undertake a quest to find Maui, a demigod, and ask him to remove an island curse. “Moana” has lots of memorable, original songs and features the voices of Nicole Scherzinger, Auli’l Cravalho, Dwayne “The Rock” Johnson and others. “Sing” is the story of Buster the koala bear who is struggling to keep his theater business open. He decides to hold a singing contest to bring paying customers into the theater. Lots of talented animals audition, and among those selected are a shy young elephant named Meena, a gorilla named Johnny, Rosita the pig and Mike the mouse. This movie has many songs you’ve probably heard before, such as “Crazy in Love,” “Stay with Me” and “Call Me Maybe.” You may recognize the voices of well-known actors including Matthew McConaughey, Scarlett Johansson, Seth MacFarlane and Reese Witherspoon. Don’t forget to bring a blanket or lawn chairs to Movies in the Park. You can bring your dogs. provided they are well-behaved and on leashes at all times. No smoking or alcohol is permitted in the park, and you’re required to pick up after yourself and your pets. Arrive at 7:30 p.m. or later. Movies begin at dusk, about 8:30 p.m.